The articulating mechanism of lamp pair Pina and Pino was taken over from Type 60 and developed further. The small Halopin light source allows the size and weight of the reflector to be reduced so that the joints function with practically no friction. 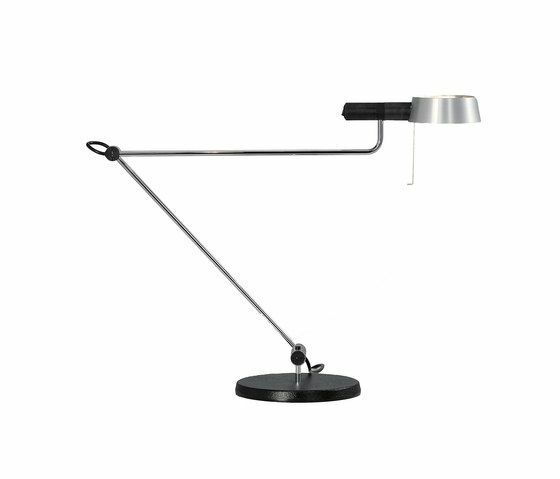 The action radius of the Pina S and Pino S makes them ideal work or reading lamps. PINA The effortless adjustability of the Pina and Pino results from the optimal sliding properties of plastic and metal. The invisible torsion spring in the base joint stabilizes the lamp in every position. The slender distance pin is combined with a yellow rotating switch and also serves as a handle for adjusting the position of the rod and reflector. PINO The insulated pin on the reflector allows effortless movement of the rod and reflector which can be freely rotated round the light source. The light-switch is built into the handle of the reflector.